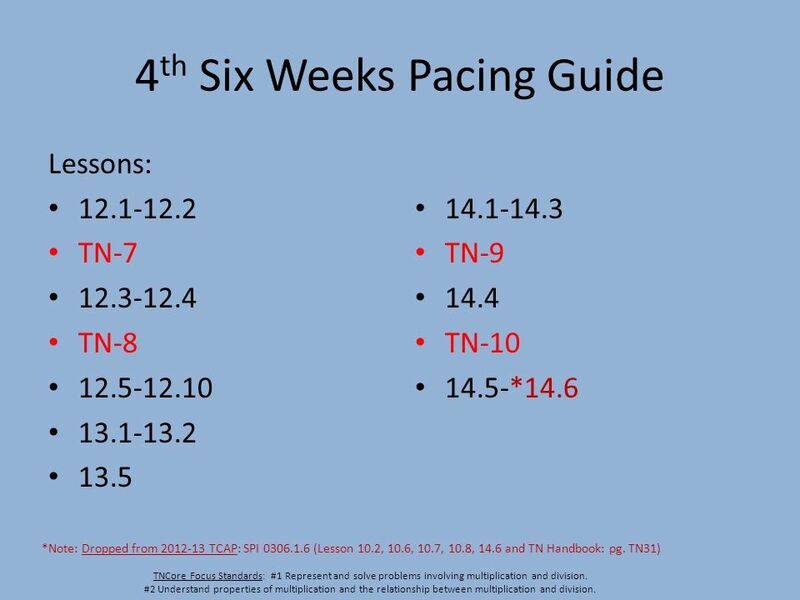 Lessons: TN-7 TN-8 13.5 TN-9 14.4 TN-10 14.5-*14.6 *Note: Dropped from TCAP: SPI (Lesson 10.2, 10.6, 10.7, 10.8, 14.6 and TN Handbook: pg. 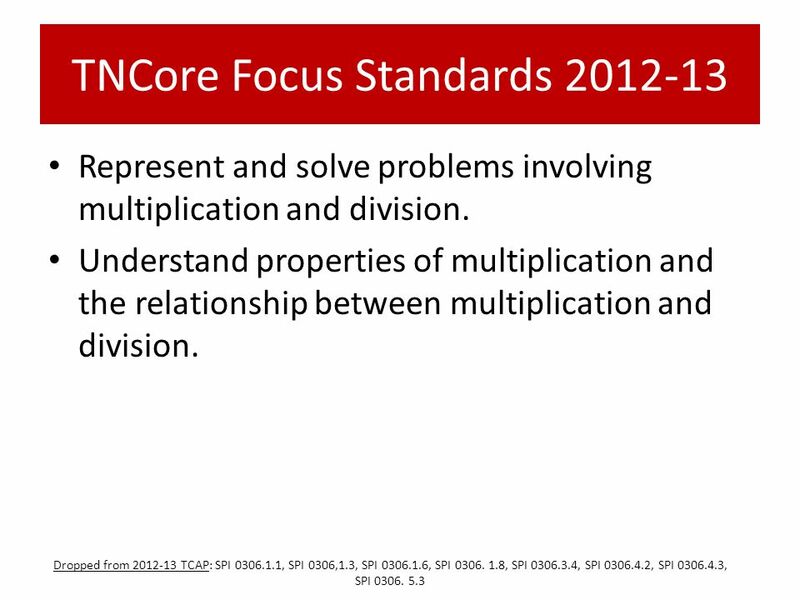 TN31) TNCore Focus Standards: #1 Represent and solve problems involving multiplication and division. #2 Understand properties of multiplication and the relationship between multiplication and division. 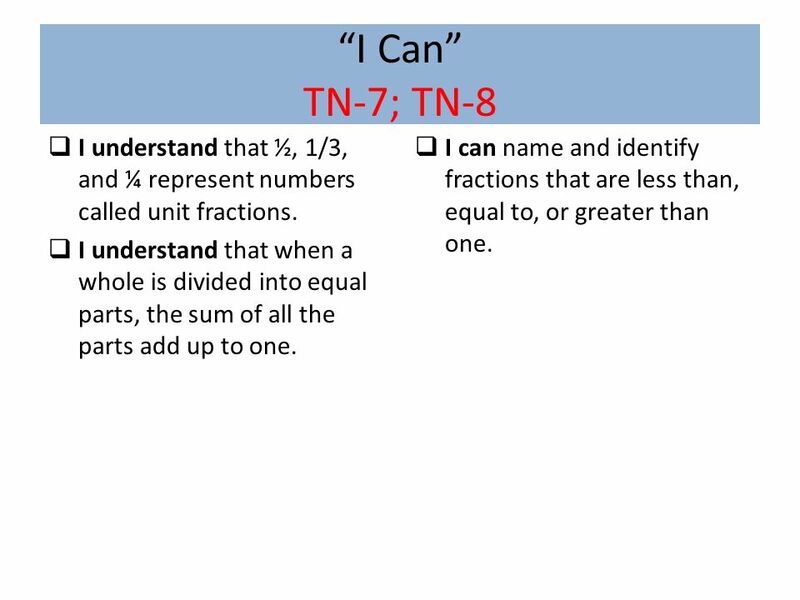 5 “I Can” TN-7; TN-8 I understand that ½, 1/3, and ¼ represent numbers called unit fractions. I understand that when a whole is divided into equal parts, the sum of all the parts add up to one. I can name and identify fractions that are less than, equal to, or greater than one. 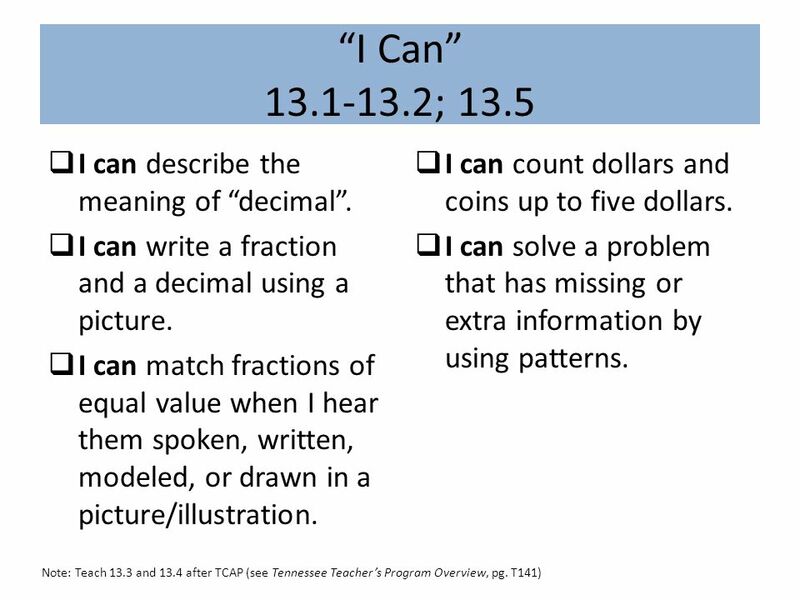 6 “I Can” 13.1-13.2; 13.5 I can describe the meaning of “decimal”. 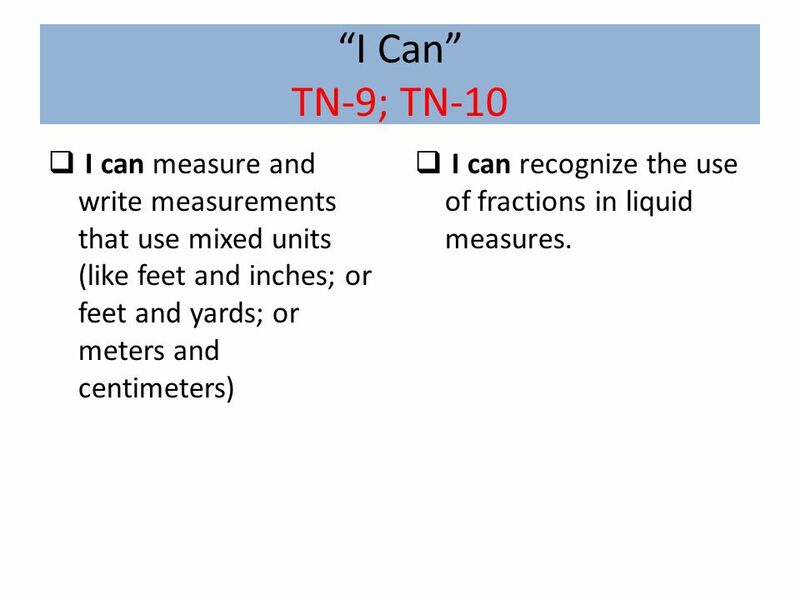 8 “I Can” TN-9; TN-10 I can measure and write measurements that use mixed units (like feet and inches; or feet and yards; or meters and centimeters) I can recognize the use of fractions in liquid measures. 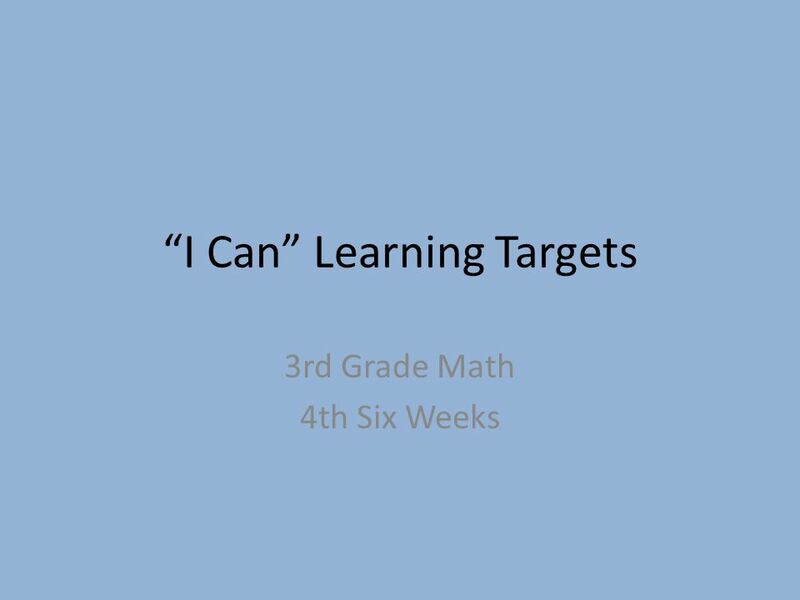 Download ppt "“I Can” Learning Targets"
3 rd Grade Math Pacing Guide Use this information simply as a guideline. Adjust the pace to meet the needs of your students. Feel free to carry over to. 4th Grade Math Pacing Guide Use this information simply as a guideline. Adjust the pace to meet the needs of your students. Feel free to carry over to. Changing Units in the Customary System Lesson 5-8. Students identify regions that have been divided into equal-sized parts and divide regions into equal-sized parts. . Envision Math - 3rd Grade - Topic. Students use models to compare fractions. EOG Night Barnette Elementary January 27, th Grade Math. 5 th Grade Math Pacing Guide Use this information simply as a guideline. Adjust the pace to meet the needs of your students. Feel free to carry over to. “I Can” Learning Targets 5 th Grade Math 4th Six Weeks. “I Can” Learning Targets 5 th Grade Math 5th Six Weeks. “I Can” Learning Targets 5 th Grade Math 6th Six Weeks. 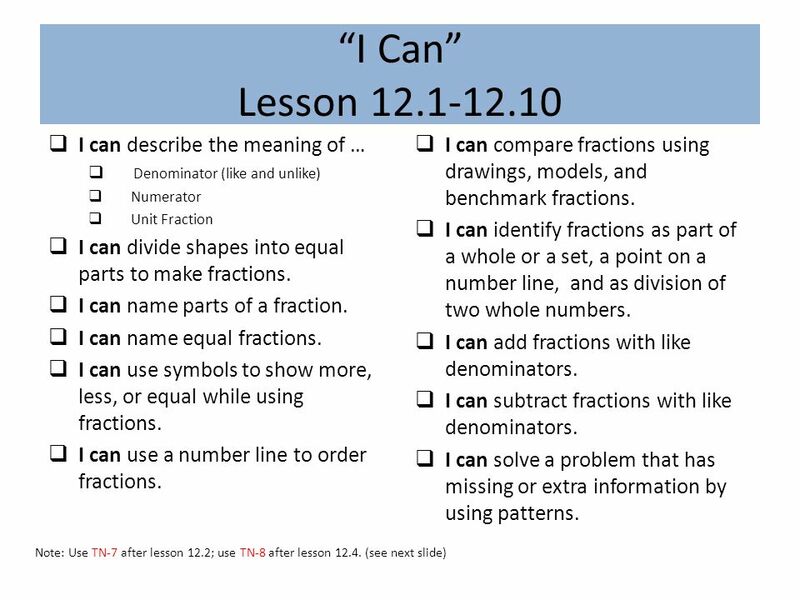 “I Can” Statements 4 th Math 1 st Six Weeks. TNCore Focus Standards Extend understanding of fraction equivalence and ordering. Build fractions. 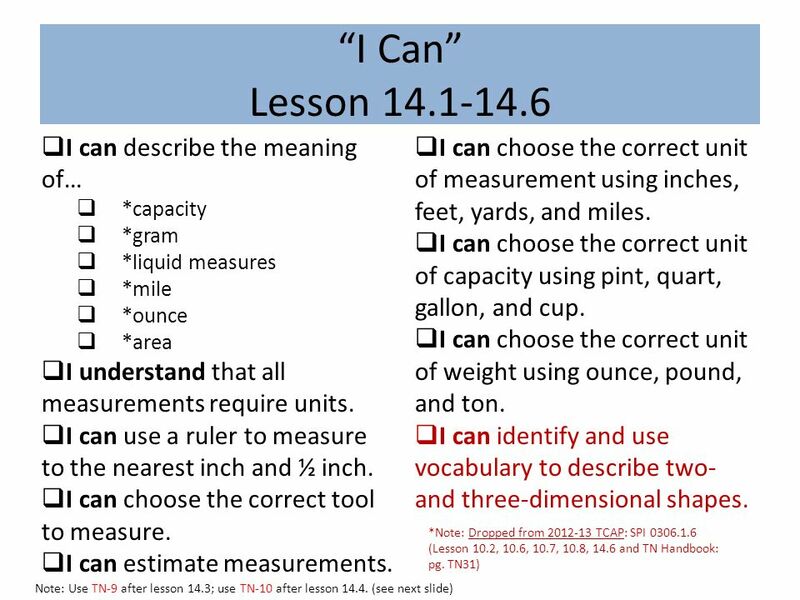 “I Can” Learning Targets 4th Grade Math 6th Six Weeks. Chapter 7 Measurement © 2010 Pearson Education, Inc. All rights reserved. 5 Minute Check Complete in your notebook x x 5 12. System of Measurement English – standard measurement in the United States, now called U.S. Customary System Uses, inch, foot, yard, rod and mile as units. Math Skills – Week 7. Class project due next week Sample final exams available on website Reducing fractions, rates, and ratios $500 huh? 17/30 hmmmmmmm. 7-1 6 th grade math Customary Units of Measurement.